New look of Aamir Khan has emerged on social media where the perfectionist actor is seen sporting a handlebar moustache and balbo style beard. 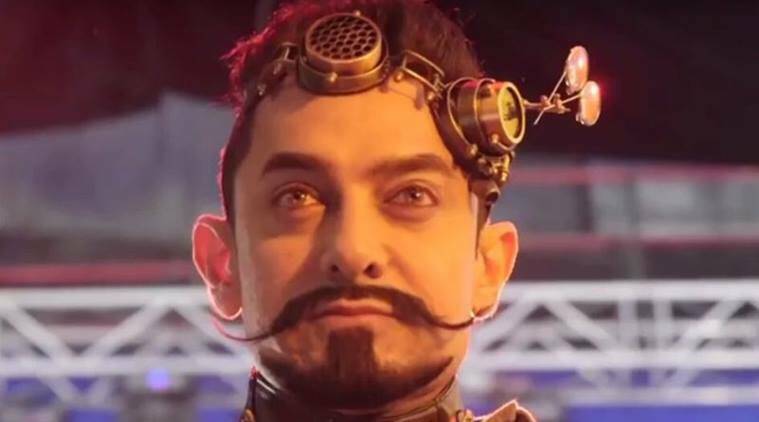 The picture which was shared by one of Aamir’s fanclubs on social media has gone viral giving rise to speculations that this is the secret look of Aamir from his next, Secret Superstar. New look of Aamir Khan has emerged on social media where the perfectionist actor is seen sporting a handlebar moustache and balbo style beard. But what catches maximum attention are the huge clips on his forehead much like the ones we usually see in the Mad Max series. If at all Aamir deserves admiration among many other things it is for his physical transformation for every role that he opts for. Aamir Khan kickstarted work on Secret Superstar at the beginning of this month. The movie marks the directorial debut of Aamir Khan’s former manager Advait Chandan and is based on the life of a child who aspires to be a singer. Aamir interestingly will neither be playing the lead in the movie nor a cameo. It’s being billed as an extended guest appearance for which the actor has been busy shooting all this while.